(12:15 a.m. EDT) -- Two ships in Tauck's European river cruise fleet, ms Treasures and ms Esprit, have undergone extensive refurbishment to have larger cabins and fewer passengers onboard. 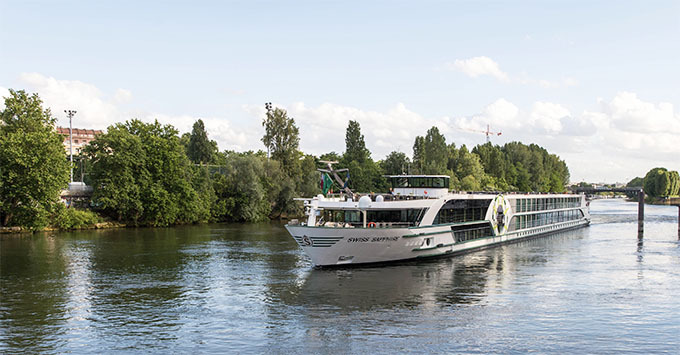 The two ships are the last in the luxury river cruise line's fleet of smaller vessels to undergo refurbishment; Sapphire and Emerald went through the same transformation in 2017. All of Tauck's 110-meter ships now carry 98 passengers, down from 118. The number of cabins have been reduced from 59 to 49, and each one has become bigger, at 225 square feet. "With this year's reconfiguration of the Treasures and Esprit -- and with identical transformations last year of the Sapphire and Emerald -- we've reimagined and enhanced half of our riverboat fleet," said Tauck CEO Dan Mahar. "Now more than ever, we believe that we have the finest, most elegant riverboats on Europe's rivers." The alternative restaurant on both ships, The Bistro, has been upgraded and renamed Arthur's, putting them in line with other vessels in the fleet. Arthur's is a more casual restaurant onboard, with open dining and an extensive menu. Treasures and Esprit will both sail on the Rhine, Main and Danube rivers. Stay tuned for Cruise Critic's coverage of Treasures, in the coming weeks.